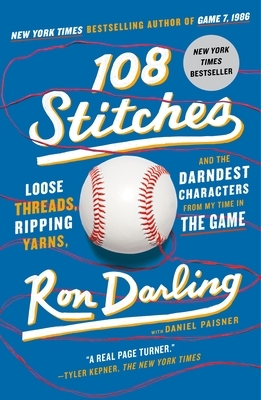 In 108 Stitches, New York Times bestselling author and Emmy Award-winning broadcaster Ron Darling offers his own take on the "six degrees of separation" game and knits together wild, wise, and wistful stories reflecting the full arc of a life in and around our national pastime. Darling has played with or reported on just about everybody who has put on a uniform since 1983, and they in turn have played with or reported on just about everybody who put on a uniform in a previous generation. Through relationships with baseball legends on and off the field, like Yale coach Smoky Joe Wood, Willie Mays, Bart Giamatti, Tom Seaver and Mickey Mantle, Darling's reminiscences reach all the way back to Babe Ruth and other early twentieth-century greats. Like the 108 stitches on a baseball, Darling's experiences are interwoven with every athlete who has ever played, every coach or manager who ever sat in a dugout, and every fan who ever played hooky from work or school to sit in the bleachers for a day game.